Day two of the conference for me had an eerily similar beginning: Brisk drive into the city, application of scarf/gloves in preparation to walk from the garage, followed by a never-ending screaming of “Holy hashtag it’s cold!” in my mind as I walk to the Convention Center. My first session was all about blended learning, which was presented by Marcia Kish of DSD Professional Development (@dsdPD). The workshop-style session featured a lot of useful tools that either I could use in my classes or, more importantly, share with other teachers in my district. Here’s a link to the applications and websites that were focused on. It surprised me how many web 2.0 tools are still unknown to many people in education. Socrative, Padlet (formerly wallwisher), Today’s Meet, and Voki avatars were all things that I was introduced to years ago (and some of which I have phased out of implementation). Other more recent offerings were welcome (BlendSpace, ShowMe, ThingLink), and Marcia did a nice job of implementing these tools into her workshop session materials. After meeting up with a former colleague during the keynote, I headed to the session that I was most excited for today: The LMS Smackdown! This was a participant-driven session with volunteers promoting their Learning Management System of choice in successive rounds answering the “What, When, Where, Why, and Wish” of their selected LMS. 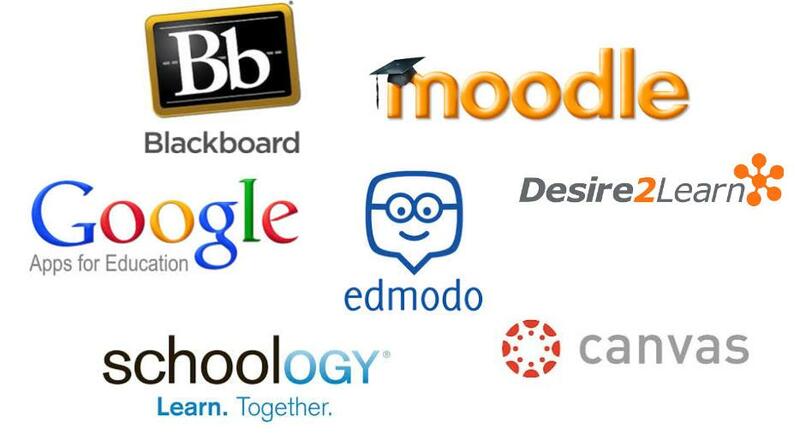 Blackboard, Schoology, Desire2Learn, Moodle, Edmodo, Google Apps, and (at the last minute) Canvas were all represented. The session was upbeat and fun, and led to some great discussions with the LMS advocates afterwards. In my classroom, I have been trying a combination of Edmodo and Google Apps for a one-two punch of communication and collaboration, and wanted to know what other options could work just as well or better. I finished my day with a session titled “Beyond 21st Century Skills,” which was presented by Edward Hill from the Ohio Resource Center. Expecting to find a session locked and loaded with more tech firepower, I was pleasantly surprised when this was a more “fundamental question” discussion. Although technology may be a part of what we do, Mr. Hill encouraged us as educators to “be brave enough to fail” when trying new things. Focusing heavily on incorporating the design process into lesson planning and having students help develop the ways in which they learn, a lot of the undertones were reminiscent of Kevin Honeycutt’s (@kevinhoneycutt) keynote and sessions from Monday. Mentioning the likes of Sal Khan and Sugata Mitra really drove the student-driven aspect home, and was an uplifting end to my time at EOTC on Tuesday. There were many other sessions that I would have loved to attend on Tuesday, but it’s just not physically possible to get to them all. If anyone would like to share their experiences (or presenters, any of your resources and handouts) tweet them @EdTechToolkit and I’ll share some of those in a future post. Thanks to everyone who made day 2 of EOTC great! OTEC is the third largest state educational technology conference in the country. Despite the cold and snowy conditions, many people in the education industry will be attending the Ohio Educational Technology Conference this week. The three-day event will be filled with a plethora of innovative individuals, groups, and companies who are looking to leave their marks on the EdTech industry, and on education in general. For those of us who have the opportunity to meet up at OETC, the choice of sessions, workshops, and participant-driven meetups (OETCx) is impressive. I have a feeling that after registering and going to my first 8:00 session I’ll adjust my plan for the day. I’ll be attending Monday and Tuesday, and look forward to seeing what other teachers are currently implementing in their classrooms successfully to being back and share with my colleagues. Hopefully I’ll have a lot to share tomorrow after day one. A great overview of the “dos and don’ts” of social networking for teachers to follow. While most of this article pertains to things to avoid doing yourself on social networks, points number 5 and 6 are geared towards ways to use social networking in positive ways to encourage, motivate, and communicate with your students. Edmodo is one of many social networks that are intended primarily for student and teacher communication in an online space. Edmodo has adopted a visual style very similar to that of facebook, which would allow students who are familiar with its layout to be more comfortable and engaged in communication and collaboration. Schoology, a hybrid social network/LMS for students and teachers, also has a facebook-esque feel that most users are accustomed to. As I read through this article, TED Ed was a service that I was not currently familiar with, but extremely excited about upon discovering. I have tried using other services to easily create content for students to access on their own (Learnist, Khan Academy, other services that I have forgotten the names of) but TED-Ed shows great promise. Like Khan Academy, TED-Ed allows teachers to assign students videos to watch to teach/reinforce concepts and then answer questions demonstrating mastery. However, TED-Ed breaks the mold by allowing teachers to create context specific to what they are teaching, and customize the lesson as they see fit (not to mention that Khan Academy primarily focused on Math concepts). After reading the article, check both of these services out to see how you could implement them in your own classroom.